Bon Jovi doesn’t know what it means to be living on a prayer…but two dozen or so people hustling about on the 6th floor of 180 York can clue him in. Week 3 at Architecture Boot Camp: Midterm Crit. We architects are not very good at math, it turns out. The end of week three (of five – not six) was marked by a day-long critique session, with guest critics who teach (or have taught) or studied (or are studying) at Yale. Everybody pinned up everything they’d completed up to that point, from the self-portrait assignment up to our last major project, The Stair. And since this is a visual program, I thought I’d walk you through my stuff with images rather than blathering on (which I might wind up doing anyway – isn’t that what captions are for?). Thanks to our anthropic measurement assignment, I now know the exact length of not only my foot (9") but my face (7"). Not sure how the latter will come in handy, but the former helped me set up this sketch. 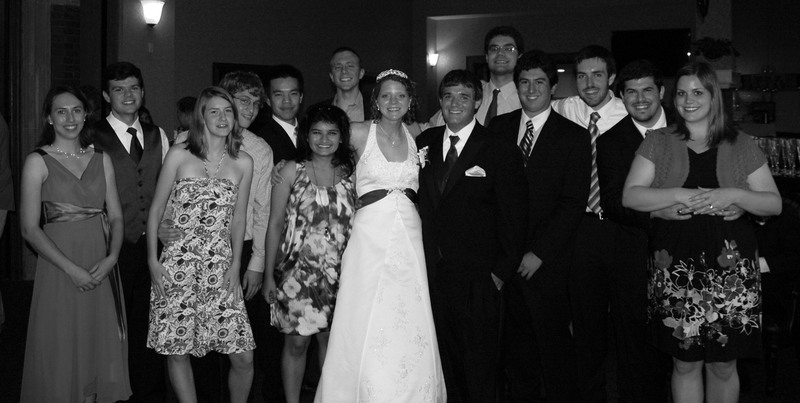 One of the major challenges of the program was time. Specifically, the lack thereof. We had to do three perceptual drawings, floorplans, reflected ceiling plans, and two sections of this site: and we had less than three hours before the museum closed. The same project as above, just another view. 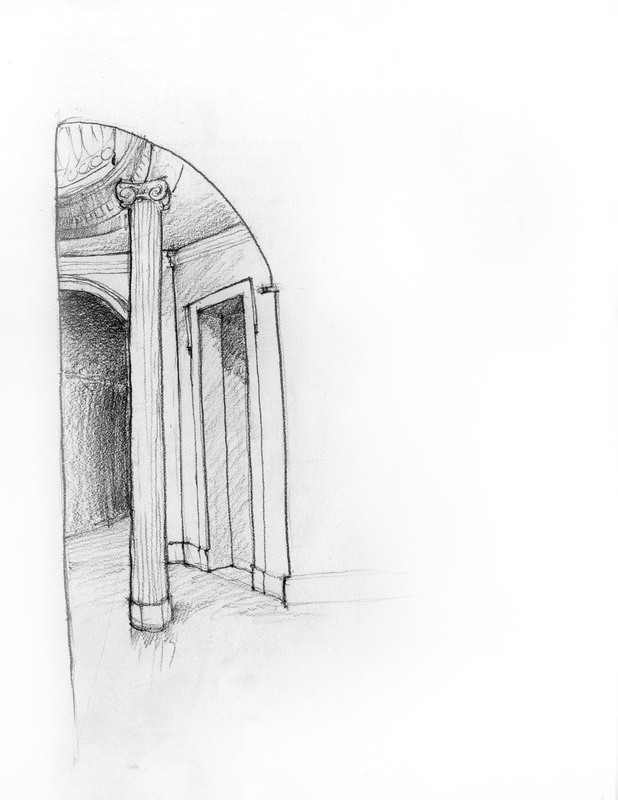 My actual hand drawings aren't scanned in correctly, so you guys'll just have to imagine my beautiful section (where I *didn't* cut through a column). Each project was more challenging than the last, and I, of course, chose the more challenging portions of each project. We were asked to chose a building from a list and reconstruct a bay (repetitive portion of it's facade) in elevation, section and plan. My building was over 100' tall...and so my paper, with the drawing at the required scale, was taller than me. ...a little bit more complicated. Especially when your professor suggests you attempt to draw three flights of stairs. I decided to focus on the handrail. 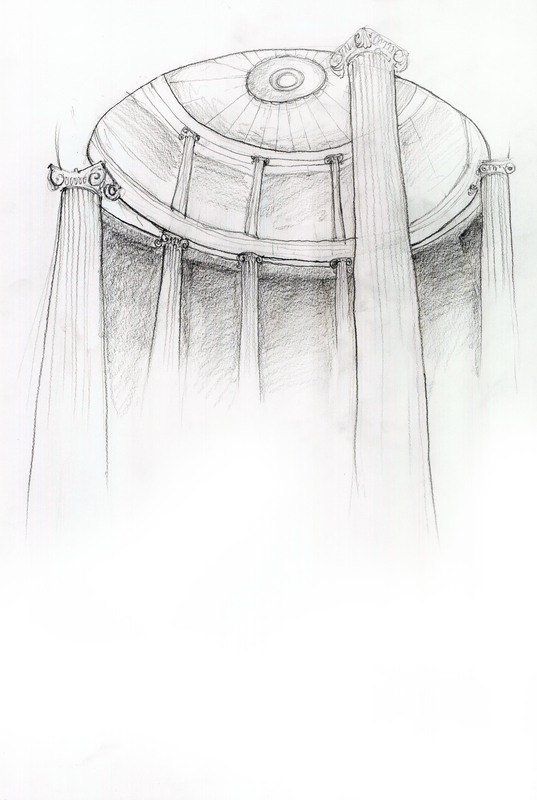 I suggest you click on the image - the small size conceals all the detail I poured over into the wee hours of the morn'. Did I mention this drawing was almost twice my height? 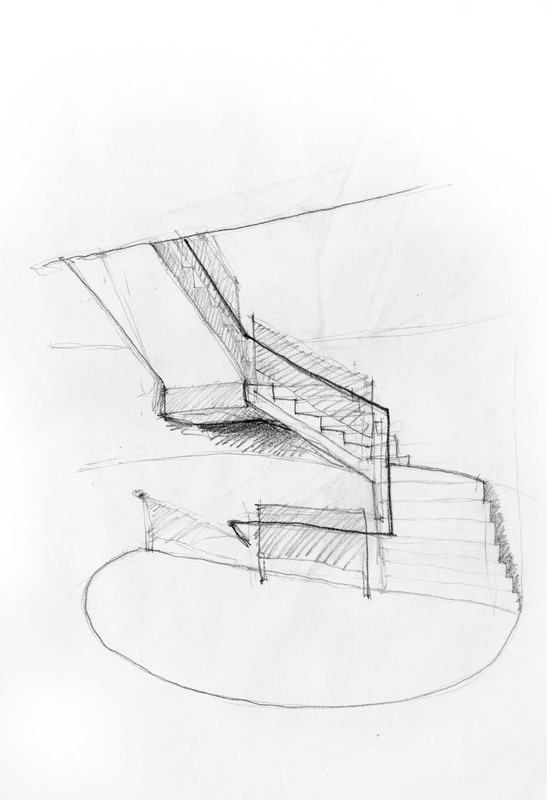 When it came to my turn, I stood shaking in my boots as one of the critics approached my 90″-tall stair drawing, peering at my seemingly unfinished drawing – only the handrail was fully drawn in, after all! He stepped back, paused, and said, “I’m going to take the pro view. I think you’re done.” The sigh I released was the largest puff of air ever to be expelled by someone under 5′-0″. The criticism got more constructive, suggestions to eliminate the scale figure, pay more attention to receding lines and their weights, etc. But boy was I glad to have a thumbs up from someone on my stairs. I’d had to re-start that drawing the night before it was due because my original construction depicted one-too-many a step on the second and third levels…and a shrinking overall plan. The lost hours of sleep? Worth it. No rest for the weary, though. Finals were in less than two weeks, and they put us back to work that very weekend. More on Weeks 4 and 5 coming soon! Word of the day: corpulent. Greetings from the cusp of Week 2-3 of Architecture Boot Camp. Technically, this is not the name of our course. Yale decided it should be called ‘Visualization I.’ But we all know better. 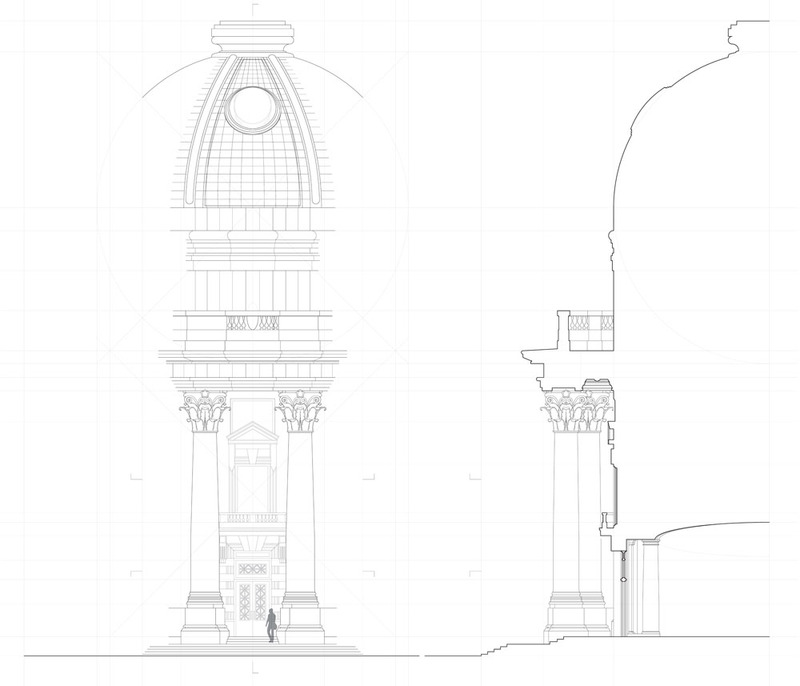 While we’re not running through mud and vaulting over fences, we’re certainly burning the not-so-proverbial midnight oil and feeling the strain of necks craning to see that one…last…line…on AutoCAD. So we, too, are suffering for our art, if not for our country. Week 2 was sketch-tastic. 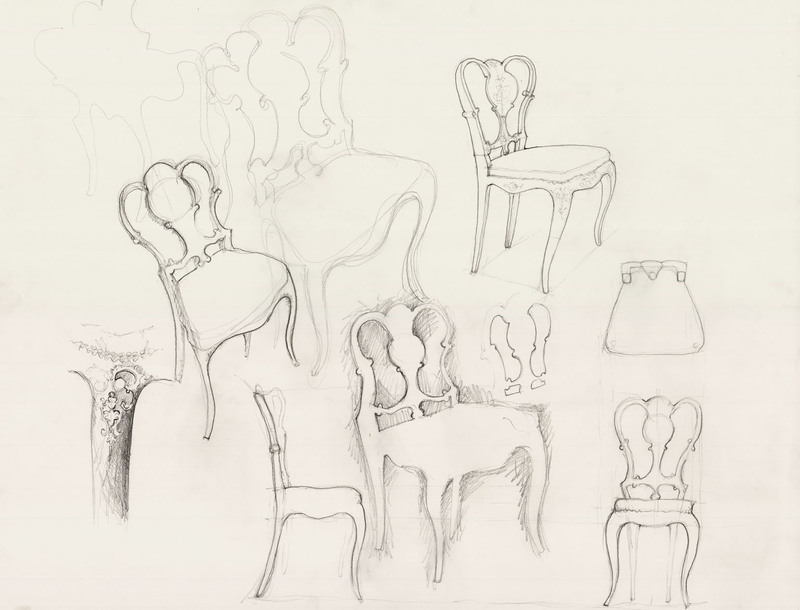 And by that, I mean that we spent hours on end sketching. Every single one of which was a needed break from the life of the AutoCAD droid that consumed our waking hours on Thursday and Friday. Instead of regaling you with more anecdotes of pain-filled minutes offsetting and trimming, I’m going to show you some sketches, so you know I actually had some fun this week! One of our field trips this week was to the American Decorative Arts Furniture Study, where I chose this adorable mid-19th century chair made of papier-mache. After our hour and a half together, I really wanted to take it home...but that's forbidden. Our professor thought we should end our rather stressful week with a relaxing exercise: life drawing. It was my first time, and I thoroughly enjoyed it - two dozen gestural sketches later, I was as limber as a yoga instructor. 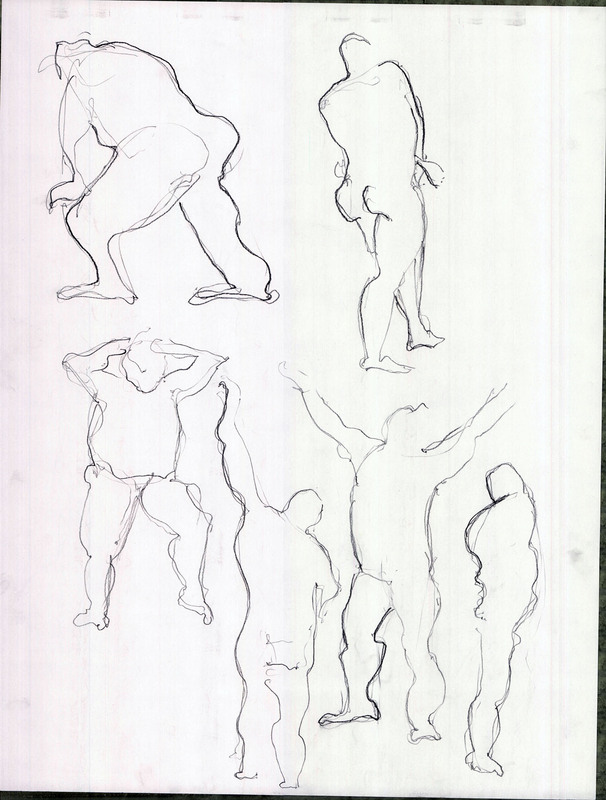 On our walk back to studio, one of my classmates asked our professor, "So, are all life drawing models so...corpulent?" The answer is, not always, but often. One of my friends from VT modeled for classes, and she was certainly not corpulent. 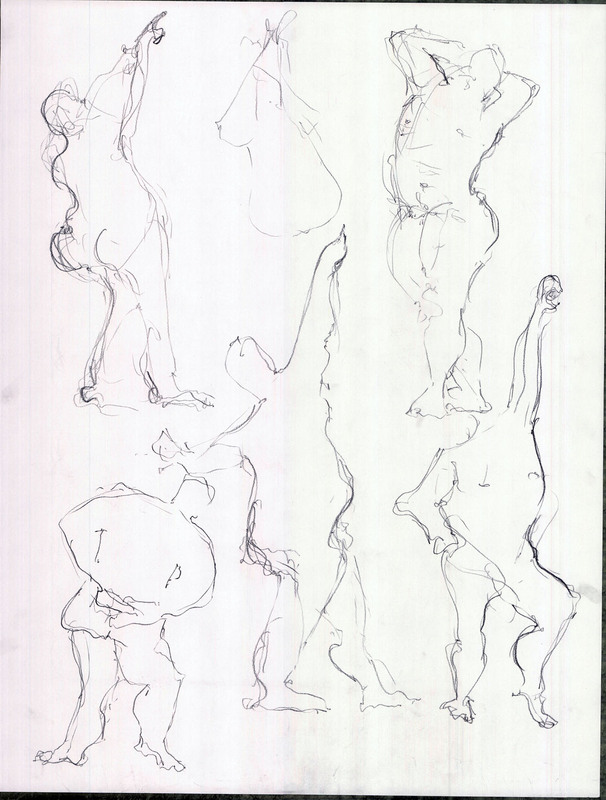 But it is a lot of fun to draw the bulbous body’s rolling curves. And if rotund figures weren’t a capital end to the week, I topped it off with a field trip to IKEA to shop for kitchen supplies. My current roommates are leaving on Saturday, but my new roommates (some of whom are bringing things like pots and pans and plates…) aren’t arriving till mid-August, so for a while I would be stuck in a kitchen but unable to cook…IKEA to the rescue! A few dozen dollars later, I’m now the proud owner of a colander, a pot, a pan and a sharp chef’s knife, among other things. 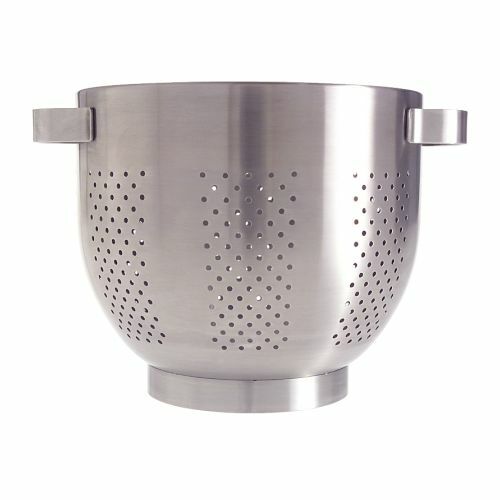 My shiny new colander! It has already been used to prepare bowtie pasta, and looks forward to many more uses in the future! Well, I should probably be off to finish the first day of Week 3. After tonight’s Rhino tutorial, I’m sure next week’s blog post won’t mention AutoCAD! Buy the gal a drink, she’s made it through the week. Week one of Architecture Boot Camp has been a success. A true representation of studio-culture, it included deceptively simple projects, late nights at the drawing board, readings from Towards A New Architecture, and jokes about ducks. I’ll explain. Deceptively simple projects and late nights at the drawing board. I didn’t know what to expect when I arrived in studio at 9AM on Monday, but it wasn’t as scary as I would’ve thought. After a round of paperwork and a tour of the building, we got to know our studio-mates and faculty with a quick round of introductions. We then promptly got our first homework assignment: a self-portrait using a mirror. 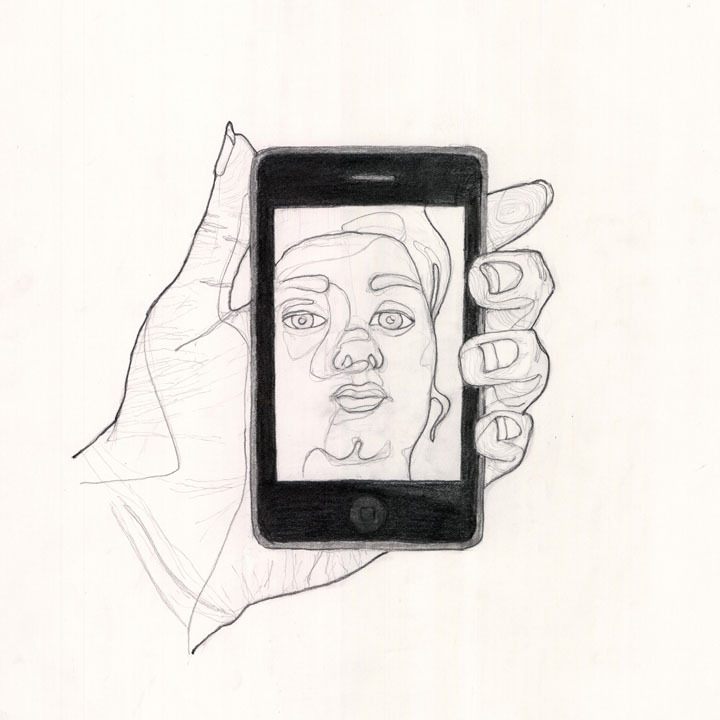 So the mirror I had handy was my iPhone...which became a commentary on our dual lives, having to create a digital persona and the bleed between the two realities. Not too shabby. 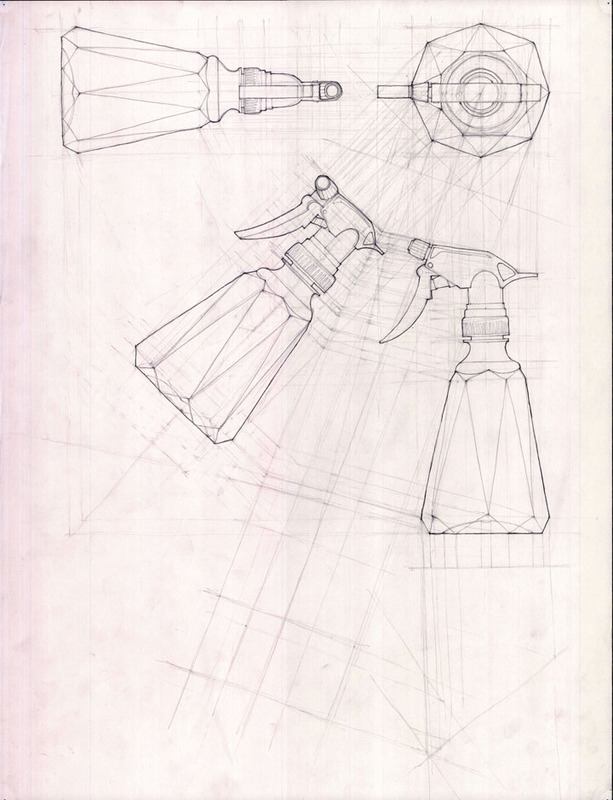 The rest of our studio assignments were familiar tasks, to me, that is: draw a room in your apartment, select and object and describe it using freehand orthographic projection…and would have been relatively easy, but I thought I’d challenge myself by choosing a spray bottle as my subject for the latter assignment, which proved more complex than the drawings I remember doing in drafting class when I was sixteen. By the time I left studio at 2AM on Friday, I’d managed to wrap my head around a double rotation of picture planes in my auxiliary view (yeah, it’s as complicated as it sounds). Two hours later, as I tossed and turned in bed, I decided I wanted to re-do one of my earlier drawings, so wound up back in studio at 7AM, taking another crack at a section of my spray bottle. It all turned out for the best, I learned a lot more from tackling this project with the complex object I chose than I would have had I selected a simpler form. Towards A New Architecture and ducks. I was very impressed by my peers: our group has representatives from across the United States, from Hawaii to upstate New York, from schools both in and out of the Ivy, those who’ve traveled around the world, worked on fishing boats in Alaska or flown in from Asia only two days before classes began. Though no one has a formal background in architecture, many have pursued the field through hobbies or internships or summer programs, and all are very intelligent, accomplished individuals. All of which made me (and my accomplishments) feel very minuscule in comparison! But it’s a good place to be – when you feel dumb, you can only become smarter, so bring on the lessons! Speaking of lessons, we’ve got 200 pages of readings to do each week, and papers to write, on top of all this studio business. So far, I’ve sunk my teeth into bits of Le Corbusier, Venturi (thus, ducks), Rossi, Kruft and Scully. I think my perspective on architecture falls somewhere between Corb. and Rossi. I believe that architecture should first serve its utilitarian purpose before attempting to make any other statement, and that often another statement need not be made. But I don’t think that buildings are machines, and certainly don’t believe there is a ‘perfect form’ that represents the Essential home or Essential office, etc. On the other hand, Rossi’s argument for urban artifacts, connected to time, focused on individuality and memory…it’s starting to sound like my senior thesis all over again…though that itself might not be a bad thing. There’s got to be a reason why I keep coming back to it, right? Anyway, before you start thinking we’re a bunch of stuffy snobs, smoking a pipe as we draw our hands across sheets of vellum, twirling compasses and articulating the ends of our line segments while cracking jokes about quacking buildings, I will point out that after our exhausting week, we went out for a rowdy night on Friday, and said almost nothing of architecture itself…for a whole three and a half hours. Kitchen Confidential: Adventures in the Culinary Underbelly by Anthony Bourdain. I’d been meaning to read this book since chancing upon an excerpt as part of the required reading for my ‘Happiness’ course senior year; I even bought it for a friend (Ms.Insulin) before I read it, knowing it would be a fantastic read – and it didn’t disappoint. Bourdain’s written voice sounds loud in this text: reading the book is like holding his hand while he spins you around his chaotic world, all the while whispering disgusting truths about the dirt under the not-so-metaphorical kitchen sink. 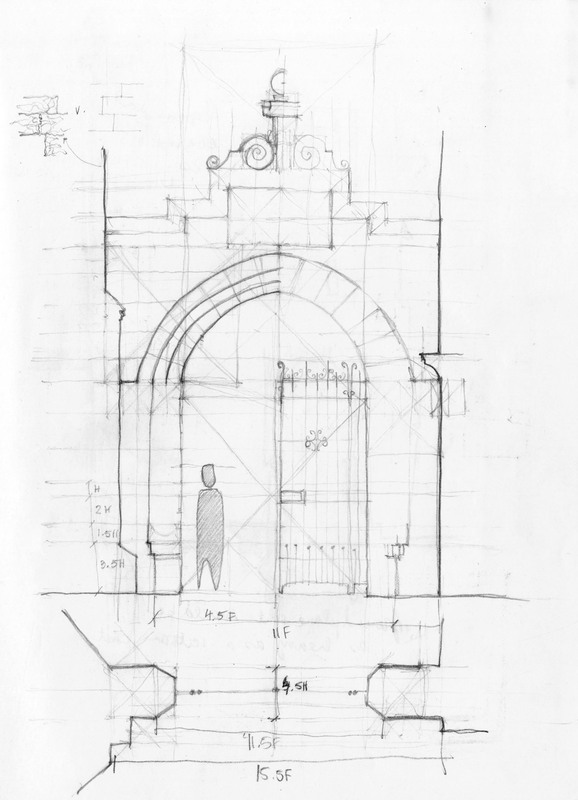 Why Buildings Stand Up: The Strength of Architecture by Mario Salvadori. I picked up this book on a whim, while browsing the library shelves. While the author does editorialize a bit too much, going on about the importance of the ‘Architect’ and ‘Engineer’, it was a worthwhile read, if only to introduce me to some principles of building I’m sure to encounter in this year’s Structures class. It makes understanding loads relatively easy…though I might suggest revising his shear diagrams and perhaps updating the text to incorporate newer structural ‘marvels,’ like the Burj Dubai. The Happiness Project: Or, Why I Spent a Year Trying to Sing in the Morning, Clean My Closets, Fight Right, Read Aristotle and Generally Have More Fun by Gretchen Rubin. Without a doubt my favorite read of the summer, and not only because I saw myself in the author’s shoes, albeit a few years younger and without a law degree (though my parents might suggest that my propensity to argue ought to’ve led to the former instead of the architectural studies that await me). As we drove up to New Haven, Rubin reminded me of the things I’d learned in Paris – to lighten up, to read what I want (be it kidlit or books on medical anomalies), to take a chance on doing something new (bikram yoga? ), among other things. I’m going to buy this book and keep it on my shelf, for those times when studio gets between me and life, and Ms.Insulin isn’t there to set me straight. Unclutter Your Life in One Week by Erin Rooney Doland. A quick read, if you go straight through, and a good guide, if you take your time to apply the principles Doland proposes. I didn’t have a desk to unclutter, but her tips on keeping travel-sized shampoos for guests and having groceries delivered are jotted down in my iPhone. Committed: A Skeptic Makes Peace with Marriage by Elizabeth Gilbert. Recommended by Poohbear, I was a bit skeptical of this read because I’m no where close to being married, and a bit wary of my friends who have, and certainly did not want convincing otherwise. I was happily surprised. If you disregard the cheesy ending, the book is an interesting sociological/anthropological survey of marriage in Eastern and Western cultures. My most interesting take-away: why do we, in the Western world, place such a burden on our significant others, by first giving them that title, and then expecting them to be not only our best friend, but our perfect lover, business partner and child-rearing teammate, when the East acknowledges that it takes a village to not only raise a child, but sustain a union? The Global Soul: Jet Lag, Shopping Malls, and the Search for Home by Pico Iyer. I will admit it now: I did not finish this book. Gretchen Rubin tells me I will be okay. I tried, I really did, but after a while, Iyer’s excessive descriptions of chaos and the alienating feeling of being country-less, well, alienated me as a reader. As a literary proposition, the book’s writing style matches the author’s intent: to convey the disorder that results in a too-global community, the loss of identity in the vagrant soul comes through every brand-laden shopping experience and self-defining national experiment. So, a success? The Name of the Wind by Patrick Rothfuss. I read this tome in one day, Scout’s honor. I did nothing else that day, but I finished it all in one go. Set in a universe somewhere between Tolkein and Rowling, the story is compelling in spite of its first-person narrative (something I’ve never been fond of), and I’m looking forward to hearing what happens next in this series. Gripes? A first novel, sure, but Rothfuss tries a bit too hard to create a unique universe. His invented language and sometimes over-capitalization (referring to the local university as the University reads like a fan-fiction writer’s habit) took away from the archetypal story of a young boy who overcomes personal tragedy to harness his God-given talents. The Mother Tongue by Bill Bryson. I’m right-smack-dab in the middle of this one, and Bryson is as good as ever. I probably look like a fool, because I can’t help but whisper this book to myself, checking Bryson’s citations of differences in Northern and Southern pronunciation for myself. At this point, I can’t say what kind of American accent I have, only that I certainly have an American accent. With the exception of The Mother Tongue, which I purchased because it was on sale for only $7 (an unbelievable price for a hardback book), the rest of these literary adventures would not have been possible without the generosity of my local library – nothing like reading to your heart’s content without a paying a penny for that pleasure! Unless you’re me, and want to hold on to the books for far longer than the library intended…oops. At this point, if you guys aren’t saying anything about my terrible sense of humor, I’m just going to keep bothering you with my shameless punning. What’s that, you say? You haven’t heard from me in ages, and in fact, you’ve been missing my puns terribly? Why, that’s kind of you! I’ll try and be more PUNctual with my posting in the future. 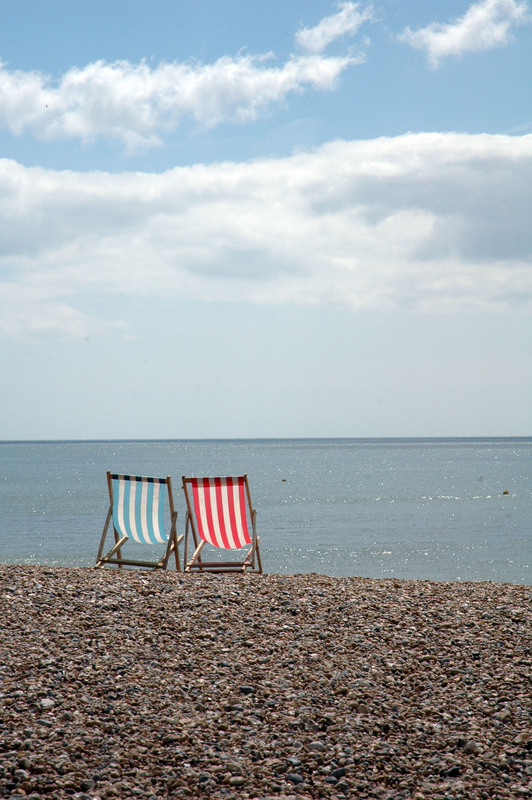 For now, let’s do a quick wrap up of the last six weeks: I got back from France (after a short trip to Britain – and Brighton – with the Brit). Then, I hung out with my grandmother for a few weeks before she left for India, where she’s staying with my aunt and uncle. After that, I put on some disposable apparel and proceeded to cover it with blobs of yellow, red, green and cream paint. See below. 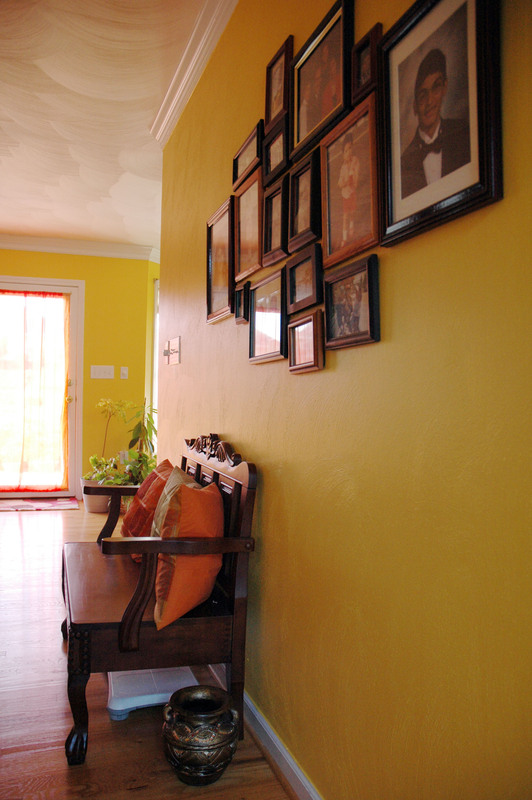 This bright yellow was carried around the living room and in the eat-in kitchen, and makes the space feel so bright and welcoming, it convinced me of the power of color much more than any design course I took as an undergraduate. Ok, so that mess got cleaned up right after I took the picture, promise! This is technically my temporary-not-temporary home. 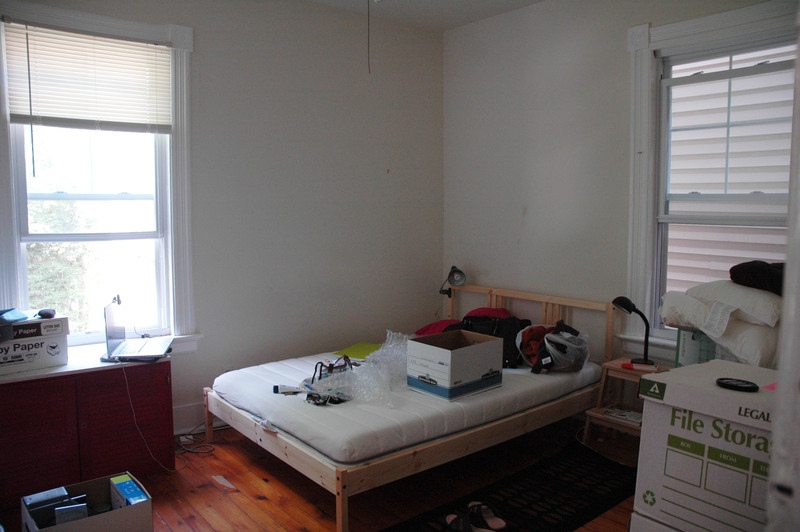 The bedroom itself won’t be mine in the long run, but I’m staying in the same apartment, just moving upstairs. Once I’m moved into the new room, and have managed to furnish and organize it, I’ll be sure to post an updated picture. But for now, you’ll have to believe me when I say my blue-green bedding and red IKEA dresser complement each other in that thrown-together-chic kind of way. I’m going for the “I liked it so I bought it” look. We’ll see how that goes – it’s a complete turn-about from the way I designed that residential interior junior year…but hopefully there’s no one grading this space! I actually got to New Haven on Monday night in my dad’s truck, with my mom and dad in the front seat, the seat beside me piled high and the ‘trunk’ packed two-boxes high with stuff. But it all fit in the truck, and I was very impressed with that. On Tuesday several trips to IKEA, Target and Walmart managed to cure me of this cheery attitude, when I realized that between the truck and new furniture (bed, dresser, bedside table) and whatever else I’d wind up purchasing in the next year (desk…rug…clothes) I’d never fit everything into one truck again. Oh well. Maybe there’s more culling to be done next year. Wednesday was organizing day, and I managed to put away all of my clothes, though my books and desk supplies are still in boxes, since I don’t have shelves or a desk on which I can put these things. We snuck my studio supplies into the architecture building, where an administrator informed me that I was the only person in the history of the program to bring my own parallel board. Well, there’s one foot forward, though whether it’s the best one is TBD. Today was my last visit with the parents, spent buying architectural supplies ($200+ worth, and that’s with a 20% discount AND without spending the $120 on a parallel straightedge), eating too much pizza at Pepe’s, a New Haven establishment, and happening upon a potential job opportunity as a French language assistant at a language institute down the street from my apartment. After bidding my parents farewell, I vegged out on my bed, exhausted after a long week. There’s still plenty that needs figuring out before classes start on Monday: where do I get groceries (the last major grocery store in town closed down, and the Walmart is driving distance when I don’t have a car)? how does the bus system work (again, no car, and studio is a thirty minute walk away)? how broke will I be in three years (utility bills on this place jump to $300 in the winter…that’s over and above the $2250 rent)? I’d like to document this first year at school as best as possible, for future Yalies who’re worried about what to expect both in the classroom and out. I know when I was trying to figure out what schools to apply to / which one to accept, reading student blogs made a huge difference. So what I’m trying to say is I know I won’t have much time, but I’m going to try my darndest to keep you guys posted every week! Until next time, your faithful-yet-often-absent blogger, Amrita.